Tajinderpal Singh Toor sent the iron ball to a national record distance of 20.75m to win his maiden Asian Games medal on the opening day of the athletics competition. 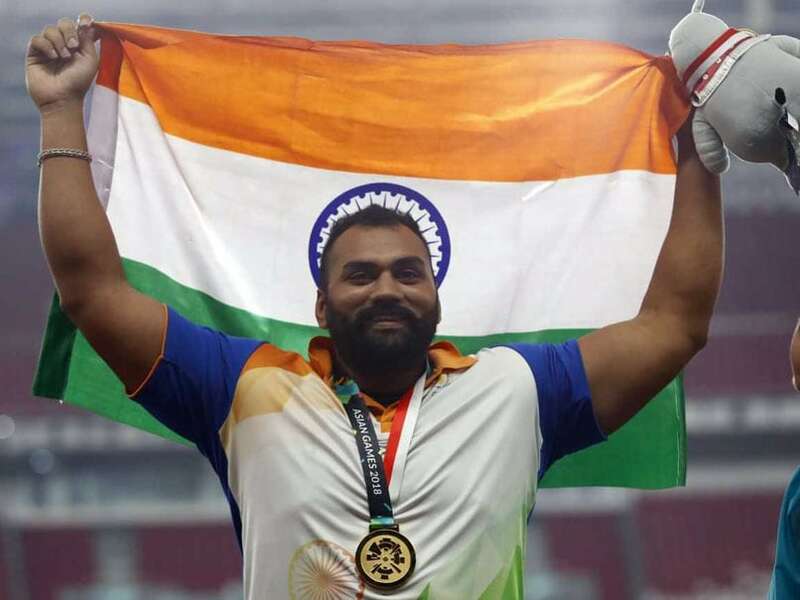 Tajinderpal Singh Toor clinched the men's shot put gold with a record-shattering throw to open India's medal account in athletics in the Asian Games on Saturday. The 23-year-old Toor sent the iron ball to a national record distance of 20.75m to win his maiden Asian Games medal on the opening day of the athletics competition. He bettered the earlier national record of 20.69m set by Om Prakash Karhana in 2012. His effort also bettered the earlier Asian Games record of 20.57m which was in the name of defending champion Sultan Addul Majeed Al-Hebshi of Saudi Arabia made in 2010 Games. Al-Hebshi was had three consecutive foul throws today to return home disappointed. Toor shattered the Games record in men's shot put to open India's medal account in athletics in the Asian Games. Toor was the favourite to win the gold as he had entered the event as season leader (20.24m). The winning throw came in the fifth attempt though he was leading the field with his first throw of 19.96m. China's Liu Yang won the silver with season best effort of 19.52m, ahead of Kazakshtan's Ivan Ivanov (19.40m). Toor, who left behind an ailing father who is battling cancer, said all his sacrifices have paid today. India's squash singles campaign in the Asian Games yielded three bronze medals after Saurav Ghosal, Dipika Palikal and Joshna Chinappa lost their respective semifinal clashes on Saturday. Saurav Ghosal frittered away a two-set advantage to lose the men's singles semifinal after Dipika Pallikal Karthik and Joshna Chinappa suffered defeats in the women's singles semifinals earlier in the day. Irrespective of the defeats, this is India's best ever show in the Asian Games in squash singles. In the 2014 Asian Games, India won two singles medals - Saurav Ghosal had a silver and Dipika Pallikal a bronze. Another national record fell by the wayside as rising star Hima Das clocked 51.00 seconds to qualify for the women's 400m final. She obliterated the 14-year-old national record set by Manjit Kaur (51.05) in Chennai in 2004. Hima finished second in her heat behind Bahrain's Salwa Naser (50.86), who is the favourite to win this event. Mohd. Anas and Rajiv Arokia also made it to the men's 400m final, which will also be held tomorrow. Anas qualifed for the final by winning his semifinal heat with a timing of 45.30 seconds, the best overall. Arokia (46.08) was second in his heat and made it to the final at overall sixth. Earlier in the day, Anas, who has a personal best of 45.24, had topped heat 1, clocking 45.63 while Arokia Rajiv timed 46.82 to qualify for the semifinals. National record holder Dutee Chand also qualified for the women's 100m semifinals by winning her heat with a fast timing of 11.38. Running in lane 4, Dutee beat Kazakhstan's Olga Safronov (11.46) and Uzbekistan's Nigina Sharipova (11.59) to win heat number two. The effort though was slower than her national record of 11.29 which she had clocked in Guwahati in June. 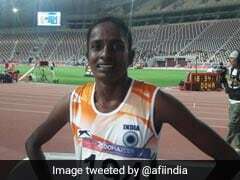 In the women 10,000m, Suriya Longanathan (32:42.08) and Sanjivani Baburao (33:13.06) faded towards the end to finish sixth and ninth respectively. Long jumper M Sreeshankar also qualified for the final after finishing fourth in the qualification round by clearing a distance of 7.83m. In the high jump also, Chetan Balasubramanya qualified for the final by clearing 2.15m. None of the 13 qualifiers, however, could touch the automatic qualification mark of 2.20m. There was disappointment also as Sarita Singh finished fifth in the women's hammer throw as she could only clear 62.03m, which was far behind the mark of podium finishers Na Luo (71.42m), Zheng Wang (70.86m) and Hitomi Katsuyama (62.95m). Toor sent the iron ball to a national record distance of 20.75m. Toor bettered the earlier national record set by Om Prakash in 2012. Tajinderpal Singh Toor won his maiden Asian Games medal.